Guys, you know what I love? Cheesecake. You know what I don't love? Making cheesecake. I'm a terrible cheesecake-maker. 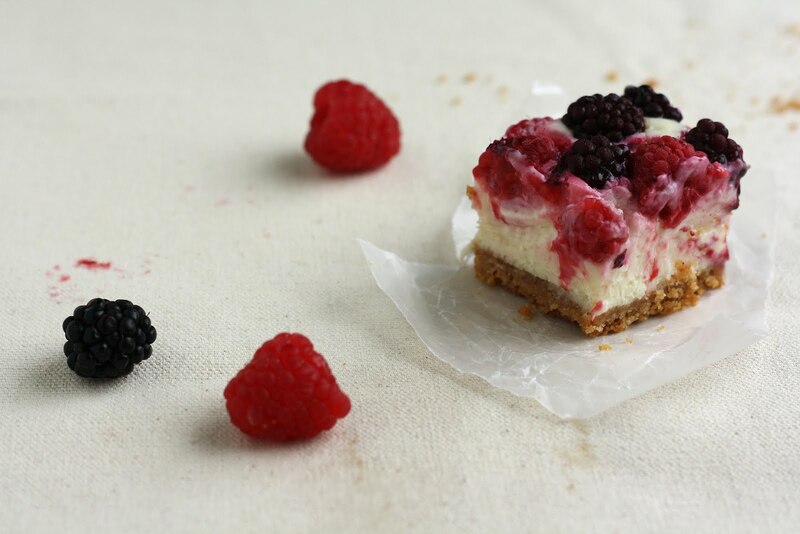 Don't get me wrong -- the cheesecake almost always tastes delicious. But it looks ugly. Oh so ugly. No matter what method I try, whether it be the water bath method or cooling the cake in the oven, my cheesecake always emerges from the oven with its top split in cracks. And boy, did it live up to its promise. The recipe instructs you to top the cake with berries before baking, so you don't really need to worry about the appearance of the cake. Topping it off with berries also lends a tartness to the cake that prevents it from becoming too sickly sweet. 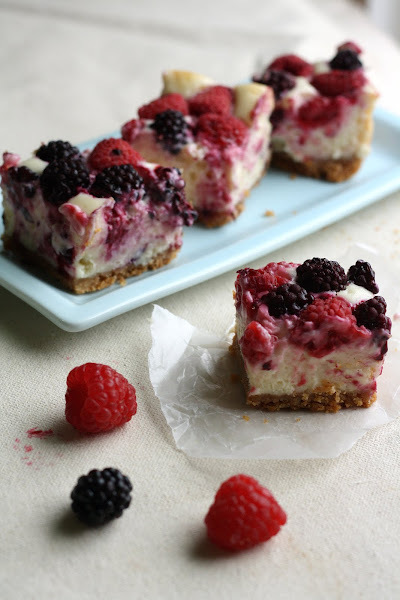 These cheesecake bars were everything you could ask for in a cheesecake -- creamy and delicious, without the need to fuss with weird cheesecake baking methodologies. My only problem with the recipe was that I wished it made more than an 8 x 8 pan's worth... but I guess that's a good problem to have, right? Preheat the oven to 325 (F). Fold a 16-inch long piece of foil to an 8 x 16 -inch stip and place in the baking pan, leaving an overhang on 2 sides. Repeat with another sheet of foil in the opposite direction, lining the pan completely. Spray bottom of the foil lightly with nonstick spray and set aside. In a medium bowl, whisk together 1 1/2 cups graham cracker crumbs, 2 tablespoons sugar, 1/4 teaspoon salt, and 1/4 teaspoon cinnamon. Add 6 tablespoons melted butter, and stir completely into the dry ingredients to combine. The mixture should have the consistency of wet sand. Use a rubber spatula to transfer the mixture to the baking pan, and, using the back of a spoon or your hand, press evenly into the prepared pan. Bake for 10 - 12 minutes, or until fragrant and golden. Set aside on a wire rack to cool. Use a double boiler to gently melt 8 oz. white chocolate, taking care not to scorch. Set aside to cool completely. In the bowl of a freestanding electric mixer with a paddle attachment, cream 16 oz. cream cheese on medium-high speed until smooth and creamy, about 1 or 2 minutes. Add 2 eggs and 1/2 cup sugar and continue beating on medium speed until just combined. Use a rubber spatula to gently add the cooled white chocolate (from the first step) and 1 teaspoon pure vanilla extract, stirring by hand until just combined. Spread mixture evenly over the baked and cooled graham cracker crust and tap the pan gently on the counter to let the cheesecake filling gently spread out and settle in. Sprinkle the top of the cake with 1 1/4 cups wild berries, pressing the berries ever so slightly with the back of a spoon so that the berries are almost level with the cheesecake filling. Bake in the preheated oven for 40 - 45 minutes, or until the cheesecake wobbles just slightly through the center and the edges are a little golden. Remove from the oven and cool completely on a wire rack, before placing in the refrigerator for at least 3 hours to chill thoroughly. This is amazing,must be very delicious! It looks incredibly delicious! 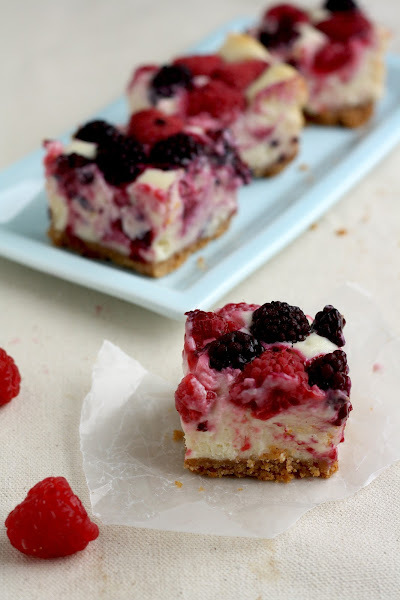 I love both simple cheesecakes like this one and over-the-top ones..I've never heard of using white chocolate though. I'm sure it adds so much. They look irresistible with fresh berries. Ohhh my goodness these look amazing!! 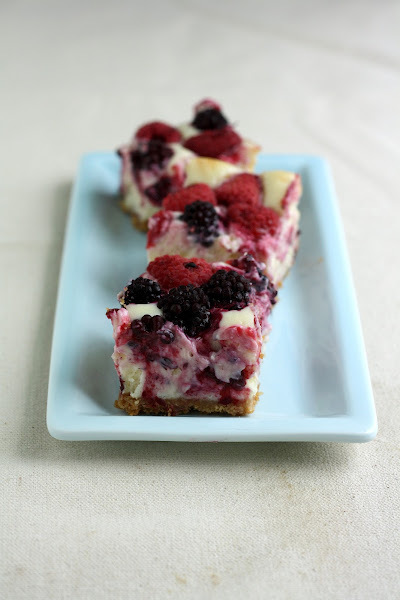 I just had some berry/cheesecake bar a few weeks ago and it was so good I wished I had the recipe. I'll have to try these and see if they live up!